As businesses continue to embrace the cloud, many are migrating their most heavily used business applications, including office productivity, CRM, customer care, and more. In today’s increasingly anytime, anywhere workplace, this is a productivity booster for office employees, remote workers, IT staff, and others who need to stay connected with each other, customers, business partners, and suppliers regardless of their locations or devices. 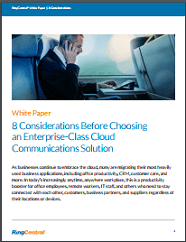 If you’re considering migrating your business communications solutions and applications to the cloud, it’s important to evaluate unified communications as a service (UCaaS) providers and platforms carefully to ensure you choose the best option for your organization in terms of quality of service (QoS), functionality, reliability, flexibility, performance, scalability, and redundancy to meet your requirements now and in the future.